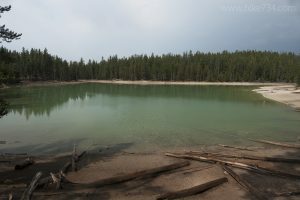 This popular loop pairs two small lakes with a long section of the South Rim Trail along the Grand Canyon of the Yellowstone River. After leaving the busy parking lot near Uncle Tom’s Trail, the trail heads southeast through trees and crosses the road popping out briefly into a nice meadow. It then enters a forest and drops down to the shores of the small, emerald colored Clear Lake. Hydrothermal activity is evident as bubbles rise on the far end of the lake. The trail traverses the shoreline, then goes around to a stretch of white, bare ground with steaming vents and boiling mud. The hydrothermal area transitions to a thick forest. Continue straight at the trail junction to work your way through the forest towards Ribbon Lake. This forested section is broken up by the occasional pond until you get to the wetlands of Ribbon Lake. The trail skirts the lily pad covered first pond and takes you to the outlet stream that becomes Silver Cord Cascade. 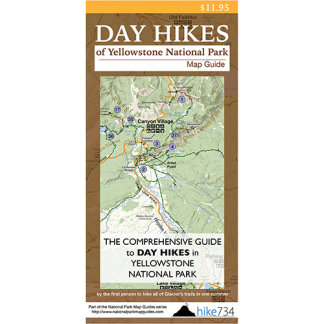 Continuing on, the trail approaches the edge of the canyon with great views all the way down to the Yellowstone River and the very bottom of Silver Cord Cascade. The trail continues to the larger pool of Ribbon Lake, which is surrounded on its edges by lily pads. Trailhead: The signed parking lot for Uncle Tom’s is on the South Rim Drive, east of Chittenden Bridge located south of Canyon Village. The trailhead is found along the eastern edge of the parking lot and heads towards the road.